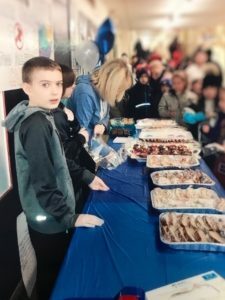 Noah Savlov is a grade 5 student at Ledbury Park Elementary and Middle School in North York, ON, who is looking to make a difference in the world of food allergies. Noah has food allergies to pecans and walnuts. Along with his friend Owen Zinberg who also has food allergies, Noah organized a bake sale fundraiser for his school. Their bake sale raised over $200, with half the proceeds being donated to Food Allergy Canada. Way to go Noah and Owen! Not only did Noah raise money for food allergies, he also spread food allergy awareness by doing a presentation for his class. Noah recently spoke with us about his bake sale and food allergy presentation. What was your goal? How did your classmates and peers respond? I did a bake sale with my friend Owen to raise money for food allergy. It was a great success! There was a line to the end of the hallway, and we sold out of our baked goods! Did your fundraiser make people respond differently to others who have food allergy? Do they understand food allergy better? Did they have a lot of questions for you? My fundraiser helped raise food allergy awareness. I did my presentation on epinephrine auto-injectors. My class had questions on how to use one, so I showed them how with an EpiPen trainer. They had a better understanding of food allergies and auto-injectors after my presentation. 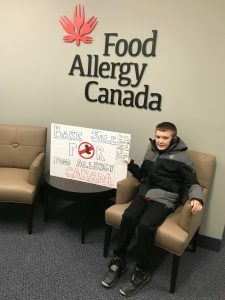 Why did you decide to fundraise for Food Allergy Canada? I wanted to raise money for food allergies. Is there anything you would like other kids with food allergies to know? To help spread food allergy awareness and to bring safe-snacks to school to make sure all kids are safe. Thanks Noah for being a food allergy hero, fundraising for food allergies and spreading food allergy awareness at your school! Learn more about organizing your own fundraiser!